Aikido de la Montagne suggests a 3-month introduction for adults. You can start at any time. A separate program exists, during the school year, for children. 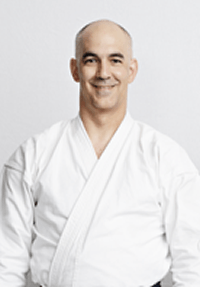 Under the direction of the chief instructor, Claude Berthiaume Shihan, 7th dan, the introduction will provide you with a solid base to progress in aikido. It also provides an opportunity to improve your physical conditioning and may be the start of a long and wonderful adventure. The introdutory fee provides access to 3 classes per week, created with the needs of beginners in mind. You will practice with more advanced students and will benefit from their experience. We encourage you to attend as many classes as possible. After you have attended approximately 12 classes and you can fall safely, you may ask to attend more advanced classes. After 3 months, learning approximately one basic technique each week, you will have completed one cycle of instruction. By this time, you may have already taken the 6th kyu (first) exam, the first along the path (of 6 exams) towards a first-level black belt. To see all classes, beginner’s and advanced, click here. The dojo is open each day approximately a half hour before the start of classes. If you only want to watch a class, present yourself at the desk near the door. The 3 basics classes are open to beginners. The more regularly you attend classes, the better your introduction to aikido will be. If your current schedule does not allow regular practice, we suggest that you wait until you have a few weeks that are less busy so that you can start off on the correct foot. A free trial class is offered during one of two classes on Saturday. The trial class is an opportunity to find out about aikido beyond verbal explanations and watching it. Please arrive at the desk near the dojo entrance by 11 a.m. This will give you the time to sign the waiver and change your clothes. Bring a white martial arts uniform (gi) or sports clothing that covers your legs entirely (to protect against mat burn) and has short or long sleeves. If you have long hair, tie it back. Your nails should be very short. Please do not wear jewelry or have items in your pockets. We usually practice with bare feet. Bring a pair of slippers or zori. When you enter, you remove your shoes and use your zori to walk around in the dojo. Remove your zori (heels towards mat) when you enter the tatami (training mats). Please do not borrow someone else’s zori. Being on time is important. It is not polite to be late nor is it a good idea to miss the warm-ups at the start of class that prepare you for practice. Leave yourself around 20 minutes to familiarize yourself with the space, change into your gi, tie your belt and to be ready before class. Waiting for the start of class, take advantage of the time to relax and to make the physical and mental preparations you need. Each class starts with a warm-up and stretching with special care given to joints. During classes available to beginners, warm-ups generally include exercises in falling and basic footwork and, beginners’ receive special attention. 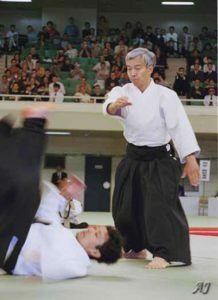 The rest of the class is usually devoted to the practice of aikido self defense techniques and forms (“katas”) that the instructor demonstrates. Students usually practice in pairs, taking turns as attacker and defender. The dojo (school) opens everyday, half an hour before the beginning of a class. If you wish only to observe a class, come to the front desk and you will be directed. The day that you take your first class, allow for twenty minutes to register and get acquainted with the place. Bring an extra pair of clean sandals, flip-flops or zoris. Remove your shoes in the front area and put on your sandals. Keep those on in the dojo until you step on the tatami (mats). On the way out you may take them home or place them on the shelves in the entrance. Do not be late. Classes begin with warm ups customized to the practice of Aikido or Iaido. Before class, take time to relax and indulge in the physical or mental preparation which suits you best. Aikido is not a religion but it remains deeply influenced by traditional Japanese values. A centerpiece is Rei, which means “appreciation and respect” and the manner by which it is expressed (Reigi saho). 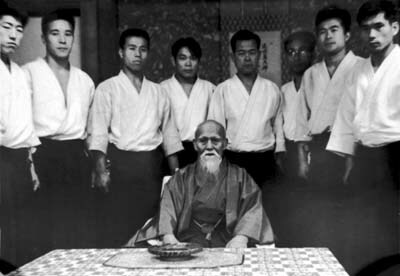 Rei is shown to O’Sensei (Founder of Aikido), to the sensei (instructors) and to training partners. Better than adversaries your partners are critical to your improvement and they are required to help you if they are more advanced. Lacking respect towards them goes against such a spirit and is unproductive. Remain humble and sincere, your progress will be faster. During class or free practice, overcome your aggressiveness. Before and after practicing with a partner show respect and bow to him. A picture of the Founder and that of other late grand masters are hanged on the wall of the Kamiza (altar) typically unadorned in the Japanese way. Respect and gratitude to the founder for his legacy are displayed in the form of bowing. 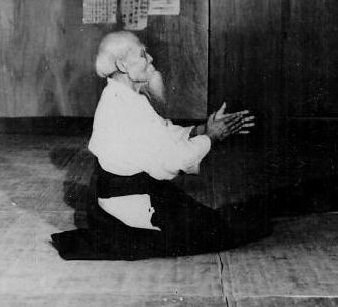 Upon entering or leaving, the dojo, the bow is executed standing up, bare head, arms along the side of the body and facing the Kamiza, Upon stepping onto the tatami, kneel down in seiza (sitting on the heels with the back straight) and bow to the Kamiza both hands on the mat in front of you. The instructor and students bow to each other at beginning and end of every class, after bowing to the kamiza. If you are late for class, wait on the side of the mat for the instructor to wave you in. 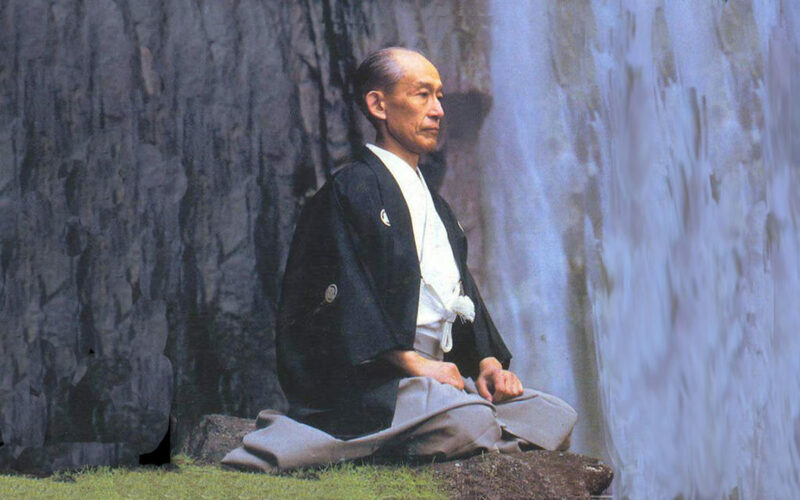 When the instructor is demonstrating in front of the class or to you personally, sit down in seiza. When he is finished, bow before resuming your practice. If you are unable to continue the class, make sure to notify the instructor before leaving the mat. During the bow at the start of class, the traditional way to greet the instructor is by saying “Onegai shimasu”. At the end of class, we say “Domo arigato gozai mashita” to thank the instructor for practice. For a better understanding of Reigi Saho the reader may consult an article written by Kanai Sensei. There is more to respect than just bowing. The following list is indicative not exhaustive. Have all nails cut short and remove any jewelry or sharp belongings before stepping on the tatami. If you tend to sweat a lot, wear a T-shirt, insert a towel in your gi to dry your face. Place your shoes and your zoris (sandles) in an orderly manner not blocking the way to others. Many movements in Aikido are inspired by weapon handling. 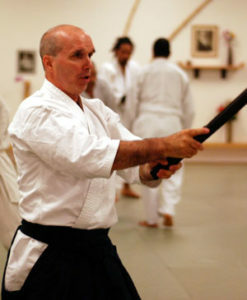 Bokken (wooden sword), Jo (staff) or tanto (wooden knife) are weapons sometimes used in Aikido. Practicing with those weapons helps reach a higher understanding of this martial art and improve the execution of various movements. Bow to the Kamiza before and after practicing with a weapon, holding it horizontally arms extended at eye level. The blade should be facing you. If you need to put it down on the tatami, do not drop it and lay it away from your neighbors. Make sure that the blade does not point to the Kamiza. To test for a degree you must practice hard and for a minimum number of days. (80 for the 5th kyu) and obtain pre approval from the Chief Instructor. Every day that you practice, tick the attendance sheet on the bulletin board. If your name does not appear, write it by hand at the bottom. The dojo has no employees. Instructors and administrators of Aikido de la montagne are unpaid volunteers. Membership fees pay for the rent, utility bills and general expenses. Membership expiration dates are posted monthly on the Bulletin Board. Please consult the sheet and help the management of the dojo by renewing your membership on time. The dojo needs to be maintained and kept immaculately clean. This is everyone’s responsibility. Tatamis need special care and must be cleaned at least once a day, usually after class. No permission is required to help cleaning. Observe others, ask questions to the senseis or senior students who will be glad to oblige. Aikido de la Montagne is a non profit association, open to all and whose raison d’être is the benefit of its members. Anybody registering becomes a member de facto. Assets of the dojo belong to Aïkido de la Montagne. Administrators are chosen at general assembly meetings. Aikido is a martial art created by Morihei Ueshiba (1883-1969) from a basis in the daito aiki style of jujitsu. 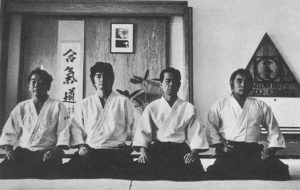 Arising from a life immersed in physical and spiritual study, at its base, aikido is defensive and distinguished from other martial arts by the fact that it does not have competitions. The word “aikido” is made of 3 characters which mean “harmony” (ai), “energy” (ki), and “path” or “way” (do). Learning aikido is based on seeking harmony. Aikido is suitable for improving both body and mind and for stimulating awareness and self-confidence. Aikido teaches how to counter an attack by returning energy to the attacker without apparent effort but with undoubted effectiveness. Aikido can be practiced with one or many partners at once. The movements are fluid and techniques are composed of grabs, locks, throws and controlling pins. Practice is intense and improves reflexes and physical health (including flexibility and endurance), yet aikido does not require partners to be of similar size nor similar skill level. 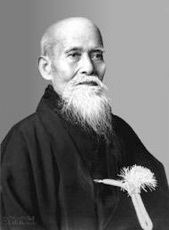 Morihei Ueshiba was born in 1883 in Japan in a village in the province now called Wakayama, south of Osaka. As an adolescent he was small (158 cm) and sickly. When he was 17, he went to study jiu-jitsu at the Kito school (Tokusaburo Tosawa) in Tokyo. In 1903, just before the Russo-Japanese war, he joined the infantry. When he left the military, he studied fencing at the Yagyu school of Sakai (near Osaka) and was awarded a diploma in 1908. In 1910, he moved with a group of colonists to Hokkaido, Japan’s large northern island. There, he met Sokaku Takeda, a reknown Daito Jiu-jitsu master. Takeda initiated him to the secrets of the sect and above all to the essence of budo (the martial way). He was certified as an instructor in 1916. In 1918, just before the death of his father, he met Degushi Onisaburo, founder of a Shinto sect and militant pacifist who became his spiritual leader. He turned towards prayer and meditation while continuing to teach budo. This was the beginning of a long spiritual journey. In 1927, he moved to Tokyo and opened a budo school whose reputation grew rapidly. He had acquired an exceptional strength which allowed him to challenge any adversary in spite of his small size. Famous masters such as Jigoro Kano, the founder of judo, sent him their students to perfect their skills. His students were hand-picked from the army, the marines, and the elite of Japanese society. In 1942 the name aikido was officially adopted. Times were hard, as Japan was at war. He left his son a half-empty dojo and left Tokyo for the countryside. He built an open air dojo in the country where he passed the next 10 years perfecting his art. 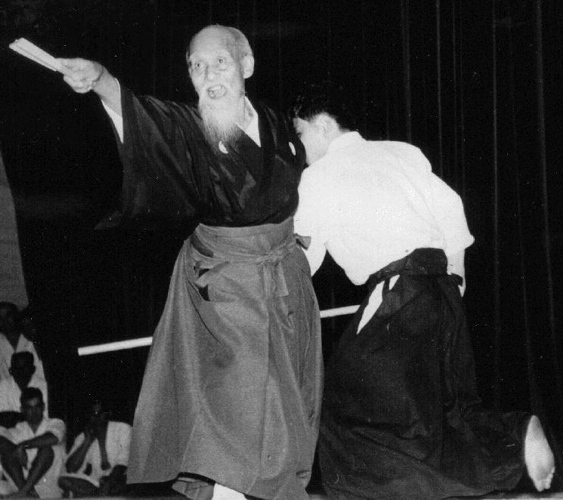 After the war, aikido developed quickly, first in Japan, then from the mid-1950s in Asia and Hawaii. By the start of the 1960s, instructors were sent permanently to live in other countries, spreading aikido to the west (North America and Europe). 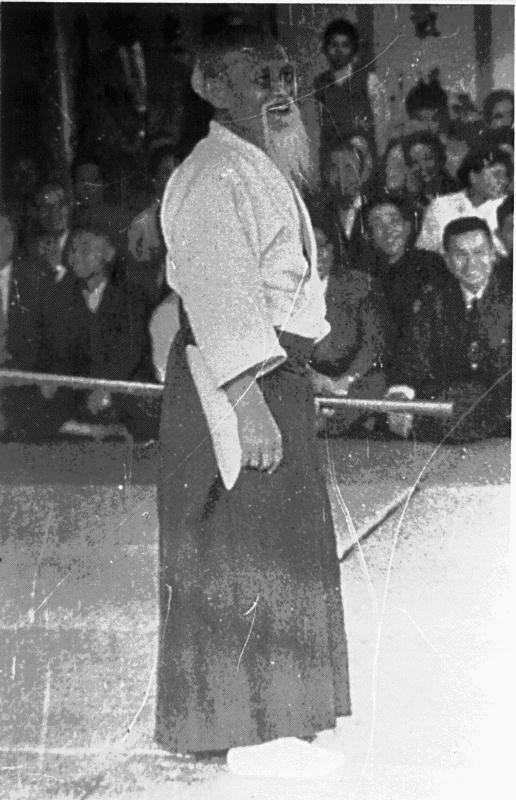 On 26 April 1969, OSensei passed away at the age of 86. 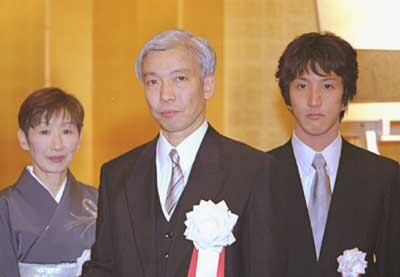 He was succeeded by his son Kisshoumaru until the latter’s death in 1999, when his grandson Moriteru took over.